The Stroop color-naming task is a very influential paradigm in cognitive psychology, elegantly illustrating concepts such as automaticity and interference (Stroop, 1935). Numerous versions of the Stroop task have been studied, and the Stroop effect is one of the most robust in psychology: When asked to report the “ink” color in which a stimulus is displayed, people are influenced by what the stimulus means even if they are told explicitly that the meaning is irrelevant. For example, subjects report that the ink color of a word is blue more quickly if the stimulus is “horse“ than if it is “red”. The longer reaction time (RT) to words whose ink color and meaning are incompatible (e.g., “red”), relative to those whose meaning is neutral with respect to its ink color (“horse“), is termed Stroop interference. The shorter RT to words whose display color and meaning are compatible (“blue“) than to neutral words (“horse“) is termed Stroop facilitation. Although the magnitude of Stroop facilitation is much smaller than that of Stroop interference, both effects have been observed repeatedly in numerous variations of the paradigm for over 60 years (MacLeod, 1991). The finding that word meaning influences RT even when subjects are told it is irrelevant demonstrates the automaticity of reading. Despite being clearly instructed to ignore word meaning, people can not help but read the words. In their daily lives people are constantly bombarded with words — in books, on street signs, on billboards — and the correct reaction to these words is to read them. In psychological terms, the association between the stimulus (word) and response (read it) has become so strong that it is now automatic and cannot be disregarded. The difference in RT to compatible, neutral, and incompatible color words demonstrates that two attributes of a single stimulus can interfere with each other. The two attributes in the Stroop task —the relevant ink color and the irrelevant word meaning — both get processed. When they each activate different responses, interference results in longer RTs to incompatible words. When both attributes activate the same response, activation of the correct response is facilitated, resulting in shorter RTs to compatible words. Numerous theoretical accounts of the Stroop effect have been proffered, focusing on the speed of processing the two stimulus attributes (Fraisse, 1969; Klein, 1964; McClain, 1983), translation of stimulus codes into response codes (Glaser & Glaser, 1989; Virzi & Egeth, 1985), stimulus-response (S-R) compatibility (Kornblum, Hasbroucq, & Osman, 1990; McClain, 1983; Treisman & Fearnley, 1969), response competition (Morton & Chambers, 1973; Posner & Snyder, 1975), and the connections between stimulus input and response output units (Cohen, Dunbar, & McClelland, 1990; Phaf, Van der Heijden, & Hudson, 1990). The preponderance of current evidence suggests that Stroop interference is caused by competing S-R translations initiated by the relevant and irrelevant stimulus attributes (Sugg & McDonald, 1994; Virzi & Egeth, 1985). Ink color and word meaning appear to be processed in parallel, and the competing response activation from irrelevant word meaning influences the timing of the response to the relevant ink color (Cohen et al., 1990). Cohen, J. D., Dunbar, K., & McClelland, J. L. (1990). On the control of automatic processes: A parallel distributed processing account of the Stroop effect. Psychological Review, 97(3), 332-361. Fraisse, P. (1969). Why is naming longer than reading? Acta Psychologica, 30, 96-103. Glaser, W. R., & Glaser, M. O. (1989). Context effects in Stroop-like word and picture processing. Journal of Experimental Psychology: General, 118(1), 13-42. Klein, G. S. (1964). Semantic power measured through the interference of words with color-naming. American Journal of Psychology, 77(4), 576-588. Kornblum, S., Hasbroucq, T., & Osman, A. (1990). Dimensional overlap: Cognitive basis for stimulus-response compatibility: A model and taxonomy. Psychological Review, 97(2), 253-270. MacLeod, C. M. (1991). Half a century of research on the Stroop effect: An integrative review. Psychological Bulletin, 109(2), 163-203. McClain, L. (1983). Stimulus-response compatibility affects auditory Stroop interference. Perception & Psychophysics, 33(3), 266-270. Morton, J., & Chambers, S. M. (1973). Selective attention to words and colours. Quarterly Journal of Experimental Psychology, 25(3), 387-397. Phaf, R. H., Van der Heijden, A. H., & Hudson, P. T. (1990). SLAM: A connectionist model for attention in visual selection tasks. Cognitive Psychology, 22(3), 273-341. Sugg, M. J., & McDonald, J. E. (1994). Time course of inhibition in color-response and word-response versions of the Stroop task. Journal of Experimental Psychology: Human Perception & Performance, 20(3), 647-675. Treisman, A., & Fearnley, S. (1969). 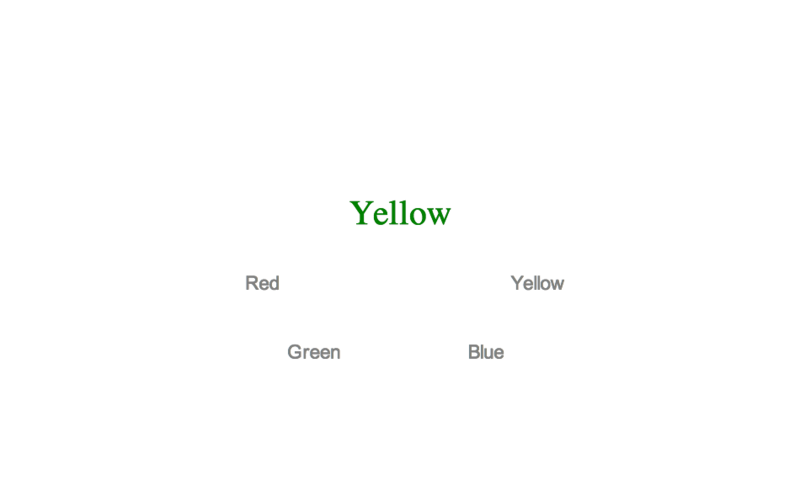 The Stroop test: Selective attention to colors and words. Nature, 222, 437-439. Virzi, R. A., & Egeth, H. E. (1985). Toward a translational model of Stroop interference. Memory & Cognition, 13(4), 304-319.